Last weekend we were invited to sail on Royal Caribbean's most technologically advanced cruise ship yet, the newest Quantum-class Anthem of the Seas. The pre-inaugural sailing was held from the port of Southampton. During our trip, we stayed on one of the superior ocean view stateroom with balcony. These staterooms are typically about 198 sq ft in floor size and comes with an additional 55 sq ft ocean facing balcony. Our room, 210, was located on deck 7 (7210). 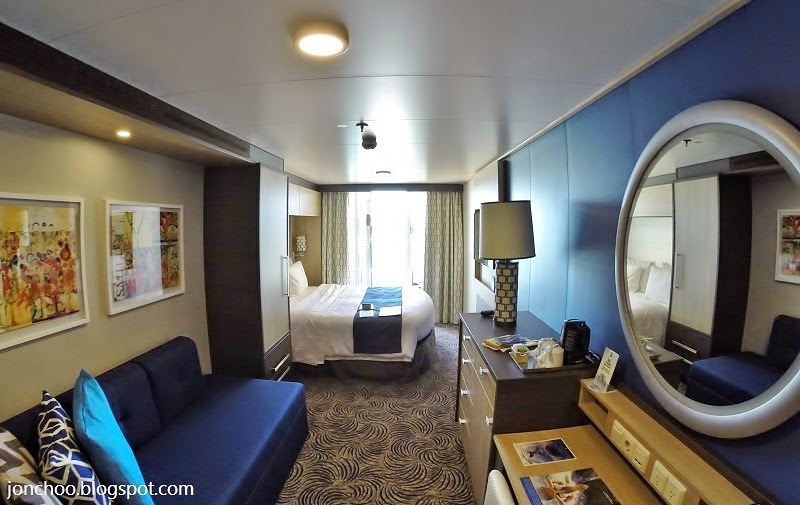 The stateroom cabin is mostly the same as the one we stayed on the Quantum of the Seas, apart from the bed which was configured close to the balcony with the sofa in the middle instead. It is also located on deck 7 just above the rows of double height yellow lifeboats. The views however are not obstructed. An interior door also connects this cabin to room 728, a deluxe ocean view stateroom with balcony. The room comes with a large super king size bed, shower room, air conditioning, a large LCD smart TV, numerous storage space, a desk with two USB sockets, a telephone, sofa and a couple of EU and US power sockets. The interiors are modern and the super king size bed very comfortable. The large TV offers numerous channels, including a streaming webcam, on demand movie rentals, the ships position in the seas and a console where you can plan and view schedules. Configurations will vary, but the short video above will hopefully give you an idea to the layout and size of a typical superior balcony stateroom on the Anthem of the Seas.